Shop DR Strings DBG10 Dimebag Darrell Electric Guitar Strings from AMS and enjoy Fast & Free Shipping. 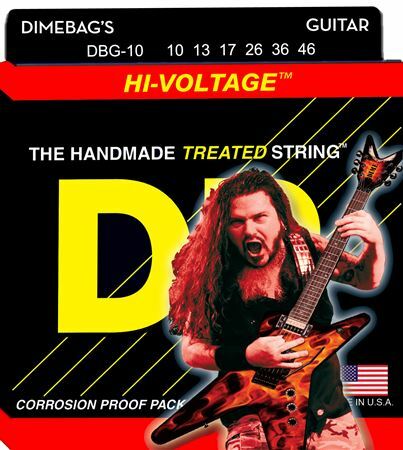 DR Strings Dimebag Darrell HI VOLTAGE Electric strings are made for extreme playing. Dime used DR's strings of strength since 1995 because of their feel - you can really get a grip on them. They're great for everything, from big 'ol string bends, to huge whammy bar dives, perfect for blood curdling harmonic screams and just straight out chunky riffin'. They also stay in perfect tune and remain fresh and bright for an amazingly long time. The strings sound as good as ever in drop tuning,and are indestructible!! !Plus by purchasing them your helping to keep a guitar legend alive!!! I've been playing DR strings for 25yrs now. These are hands down the best longest lasting strings out there. I was really hoping these would be really cool strings. The price for not coated, but "treated" strings that would last longer for much less than Elixirs. But also, just a small bonus to have Dimebags face on it. I was trusting in this string, but my entire guitar I thought was horribly setup. The issue was narrowed down to the strings! After changing these out to GHS, all of the intonation problems were cured. Before this, I couldn't even get the guitar in tune at the 5th fret, but was in tune open and on the 12th. This drove me mad! This is my 2nd time with DR. the first time, I hated how dull they were sounding vs the D addario. For now, I'm using GHS in replacement to these. I really hope DR gets better at consistency, as it being handmade probably has a great deal to do with this. I do not recommend these, even tho Dimebag one of my fave guitarists is on it.